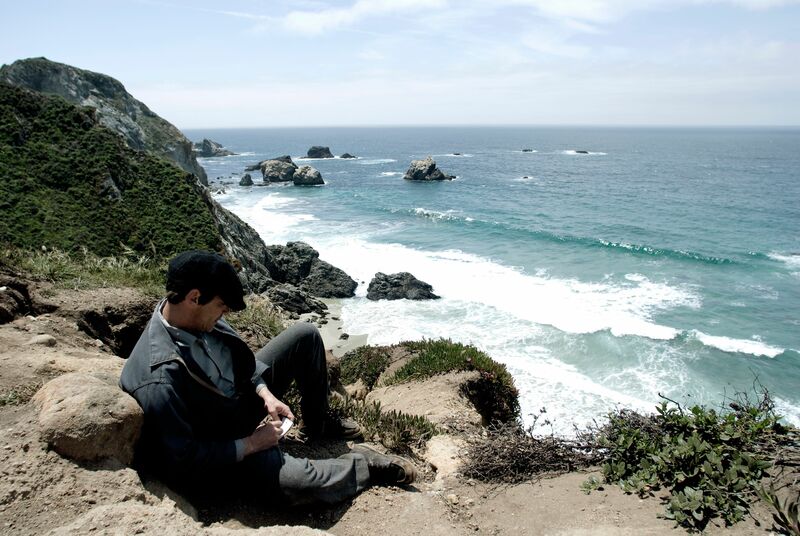 One of the many films making its premiere at the 2013 Sundance Film Festival is writer/director Michael Polish’s adaptation of the Jack Kerouac novel Big Sur. Though his work has long been described as unfilmable, there has been a bit of a boom in Kerouac feature films in the past year or so, and Big Sur marks a very faithful adaptation of one of the author’s darkest works. 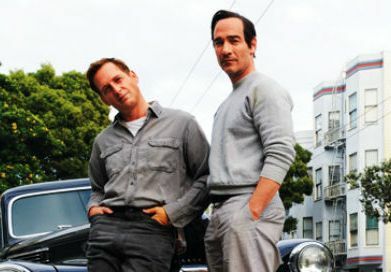 The film stars Jean-Marc Barr as Kerouac and chronicle’s the author’s struggle with alcoholism and depression in the early 1960s following the publication of On the Road. Adam: So did you guys grow up big Kerouac fans or were you Kerouac fans when you came onto the project? Or were you introduced to him through the screenplay? JOSH LUCAS: I was, I think sort of typically, in my late teens early twenties introduced to Kerouac and got obsessed and tried to live the life for a number of years and I really kind of got taken by the of that fearless, wild rock and roll life that those guys introduced to the world in a way, but I didn’t know Big Sur because to me Big Sur was sort of after On the Road, it was more Off the Road or The End of the Road. I was very much intrigued by it because I felt that those other books it’s so difficult to capture the literature of it because they’re so about drugs and partying, how do you capture that? This one’s more about the writing, and I felt like the script did it. RADHA MITCHELL: I studied literature at University in Melbourne, so I was aware of the book. I’d done some crazy journey when I was nineteen across India from Calcutta to Gola, you know on motor bikes. I remember getting off the plan without a plan at all with two guys from school and ended up in Calcutta and the first thing some beggar came up to me and said, “Ever since my mother died I’ve been very paranoid.” I’d just come in from Thailand and we were completely tripping on some experience that happened there, so it was all very disorienting and it went on for like four months. I think in a way it was inspired by Kerouac, sure, because it was a very off the cuff trip. And then I was curious when this opportunity came along just to kind of explore Big Sur itself and that whole culture which I think has inspired people globally. When you think about Kerouac, I was in Australia and he’s like an American kind of cult figure, and just the impact of those ideas was interesting to me to get right down into it. Taking on such a daunting property were you kind of worried about doing the story justice? And how did you go about preparing for the role? Because everyone kind of knows that these were based off of people that were in Jack’s life. MITCHELL: I think the actual script was just interesting. The script was so literary, so close to the book. That was like, “Wow, is this movie or is this a book? What is this?” That was the challenge of the piece and what was exciting about it. In terms of researching the character I did a little bit, but the scenes were so specific that I was more just interested in the dynamic of them and just bringing myself into the situations. But I was most taken by the challenge of what the script was presenting. How did you take on preparing for the role? Were you looking at Dean’s life or did you go back through Kerouac’s catalogue? MITCHELL: He was like a legend. LUCAS: Yeah, it was almost hard to find him because then you’d see a video of him and he was so manic and so speed-freaked out even thought it wasn’t drugs, it was just who he was, I mean drugs were a part of it too. But then to understand what was going on with Big Sur was that he was starting to burn out, you know? He was starting to desperately need to calm down, which I think is what his relationship with his wife was prartly about, the friendship between the two of them. It was a guy who was trying to get control of his life and I thought it was really interesting that dynamic between the image of the rock star Neal Casssdy, and the reality of where he now was, which was angry at his friend Kerouac for drinking all the time. I thought that was more what I was trying to key into with Big Sur, more how he shifted and how he was trying to be a good dad sometimes and he just couldn’t do it, his brain wouldn’t let him. But I found him to be one of the most fascinating characters I’ve ever played because his legend is just beyond extraordinary and yet there’s very little film of him, no one seems to know how to capture who he was other than to be around him was supposed to be like a great drug in and of itself. The relationship between Jack and Dean was obviously very complex, but within the atypical Kerouac narrative of the film these issues aren’t tackled head on like you have in most films where there are big explosive fights and lots of back-and-forth. How did you guys approach the portrayal of that relationship on a more subdued level? LUCAS: I think it’s because they’re so old, the relationships, they’re so deeply intertwined at that point that those big, broad, establishing blow-up dramatic moments you’re talking about that happen throughout relationships have sort of played themselves out with these guys and they just need each other to hang out with. I know for myself my big, long friendships they don’t have the same problems any more, but they also-when you get together you often times just have a drink and watch football together. You’re not really talking about everything so much the same way. You just need to be around each other, and yet you can look at each other and so much is said just between those minutiae- it’s totally subtle is really what it is. I felt like that, you know, a life that’s been so totally dramatic then becomes beauty in the fact that it’s just so small. MITCHELL: Also what I like about it is that it’s these characters through Jack’s eyes, his point of view, there’s no imposed history. It’s as the book tells it. It allows the actors, I think, to bring something quite personal to it, to bring themselves to it. Was there much evolution in the script from when you guys first read it to when you got on set? LUCAS: Honestly, I don’t think any. MITCHELL: Because even the dialogue is from the book. LUCAS: Yeah, and it’s precise. If anything, in the final version- we would shoot the script and in the final version I think all he did was trim stuff down a little bit. Part of the problem with Kerouac’s writing is that it’s so, particularly Neal Cassady, it’s so free form, it’s so beat poetry and its coming from such a space of- its tripping across the tongue at such high speed. MITCHELL: Especially the way you performed it, at the pace that I think it should be experienced. LUCAS: The challenge was finding that and then knowing that a lot of it was repetitive [makes jazz sounds] it’s like just sounds, he was inventing his own beat language, he was inventing sort of jazz dialogue. So then I guess as a filmmaker you then have to take it and be like, “Alright, what’s really necessary to tell the story here?” Because otherwise it’s just a lot of sounds. MITCHELL: I didn’t have as much dialogue, that’s really more of question for him [Laughs] but for me I felt it did come naturally when you just inhabit the period, inhabit your costume, and inhabit the space that you’re in, the words came out as they would have. LUCAS: For me it was finding this thing that- the way that people say “like” now, “Like, I’m going to go over there, like…” He’s doing, Dean in particular, or Neal, there’s so many names for Cassady, Cody…he would throw in like, “Slam bam, baby”. LUCAS: Anytime you had a pause or you would go “uh” he would say something that would be so irreverent and odd, and it was his way of finding whatever’s next and filling those spaces. LUCAS: The pause was filled with language. LUCAS: Yeah, it was really hard to do honestly; there were a number of times i felt like I was not really fast enough with it. MITCHELL: That’s interesting because you do have habits and rhythms that you do sort of fall into when you’re acting, but if you’ve got text that doesn’t allow you to do that it puts you in a bit of an uncomfortable space and takes you out of your habits. I felt it was almost Sorkin-like where it was very much these rhythms are specific and you have to hit this, here, on this point. You had kind of a daunting task of taking a role that’s not shown too much on screen, but you had to kind of convey that she’s domesticated Neal a little bit, but she’s also not the enemy. How did you approach conveying all that? MITCHELL: She’s not the enemy, that’s interesting. Yeah, people have a reaction to this idea of a wife, generally, I guess I probably had it myself, “Oh, how do you make her more appealing?” but I think the less you consider that, the more you get into who she is until you don’t consider that at all. So it’s just that she has this sort of moth-eaten, worn in, comfortable, beautiful relationship with Kerouac and this more complex, challenging relationship with her husband who she’s trying to domesticate, I guess, but can accept that he is what he is. I mean, you see the scene where he takes off on the road, which he does periodically, and I think that’s just part of how he manages to even stay in the relationship. I think it’s very real. I think that’s what’s compelling about the piece. I mean what’s compelling about these characters is that they’re living on the edge of their mortality a lot of the time and not afraid of death, and yet that can be incredibly self-destructive and destroys the relationships around you, it doesn’t sustain itself and you see them now twenty years later where they’ve been sustaining that lifestyle, celebrating that lifestyle, but it’s sort of destroying them. And she survives it, I mean she’s still alive today and she managed to raise three kids. So she’s been a responsible person, she struggled, I guess, trying to be both and being associated to that. Click here for all our Sundance 2013 coverage.